Somehow in the less than a year I’ve been the Teen Librarian at the JMRL Central Library I have become the resident Scavenger Hunt Expert. It certainly was never one of my professional goals. 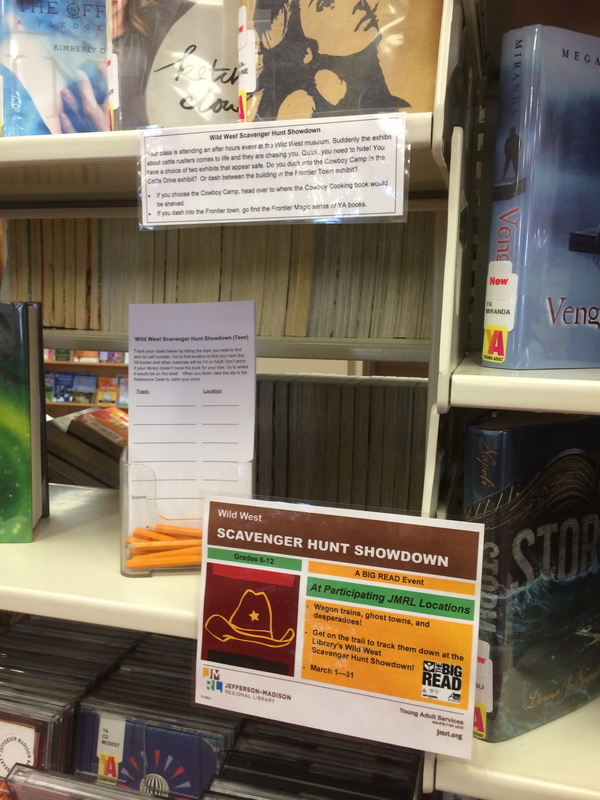 But scavenger hunts are fun ways to promote library skills, and lesser known parts of library collections, for teens. As a new teen librarian in September 2013, I was scrambling to plan my Fall programming and needed something simple for Teen Read Week. The theme, Seek the Unknown @ the Library, was well-suited to a scavenger hunt. It was an idea I had seen suggested in several places, and I knew at least one other branch in our library system would be doing one. So I decided I would do one as well. But as I looked at multiple samples of scavenger hunts, they reminded me of school assignments, not something teens would choose to do for fun. Still, I couldn’t think of a way to really improve on them. Inspiration struck when I attended a session at the Virginia Library Association’s annual conference in late September on using scavenger hunts as a family activity to promote literacy skills. The presenter was Susan Metallo of the Loudoun County Public Library. While her focus was programming for school-aged children and their families, she did mention that she had teens who enjoyed participating in her Choose-Your-Own-Adventure hunts. It was exactly the inspiration I had hoped for! My scavenger hunt for Teen Read Week led teens on an adventure with either vampires or zombies, depending on the choices they made. It led them through many areas of the library including adult nonfiction, audio books, YA fiction and graphic novels. Teens ran back and forth from the computer catalog to the shelves, finding their clues and looking up the location of the next one. They even had to check with the Reference Desk to find the location of the pencil sharpener. (What better wooden stake to fight a vampire than a properly sharpened No. 2 pencil?) The hunt was enough of a success that I was asked to create another for the JMRL big read in March 2014. Teens who enjoyed my first scavenger hunt insisted that I needed to set up another. They also asked to help create it. Their assistance not only made the process easier for me, it meant that they were thinking about different subjects that could tie in to the Big Read theme and what areas of the library had those resources. When they did the Big Read scavenger hunt, they made choices based on topics they helped choose, which pushed some of them into areas of the library they had never used before. I taught one long-time Teen Advisory Board member how to look up nonfiction books in the catalog and then how to find the book. I would never have guessed that any of my TAB members wouldn’t already know that! I will admit that Choose Your Own Adventure scavenger hunts are time consuming to create. The nice thing is that they are very low cost. I’ve learned a few tricks through trial and error that I will share in future posts. I’m sure I’ll learn more as I create more because they will become a regular part of my teen programming. All of the feedback I’ve gotten from teens who have participated is that the hunt is definitely fun. Now to figure out how to get more of them to try it! I’ve been a stubborn user of LibraryThing for a number of years and have been resisting the move to Goodreads. I liked the cataloging options at LibraryThing. But I realized that the people, including other YA librarians, were on Goodreads. To make a long story short, I finally broke down and made the switch, though I haven’t completely abandoned LibraryThing. After a little over a month on Goodreads, I though I’d reflect on the change. Everyone is on Goodreads. I am now connected to lots of other Teen Librarians. Through them I see more titles than I would find on my own. I also get a good idea of the quality or appeal of those titles. It’s a great Readers Advisory and Collection Development resource. Because more people are there, Goodreads is a good place for discussion groups, like the group of members participating in the 2014 Hub Reading Challenge. I don’t like the way Goodreads handles cataloging my reading. Every year there are several titles that I read in both print and audio formats. For me, those are two different books, two different reading experiences. But on Goodreads there is no way for me to separate them. I can’t review the audio book separately from the print book. I can note that I have read a title more than once. But I can’t separate them for my records. 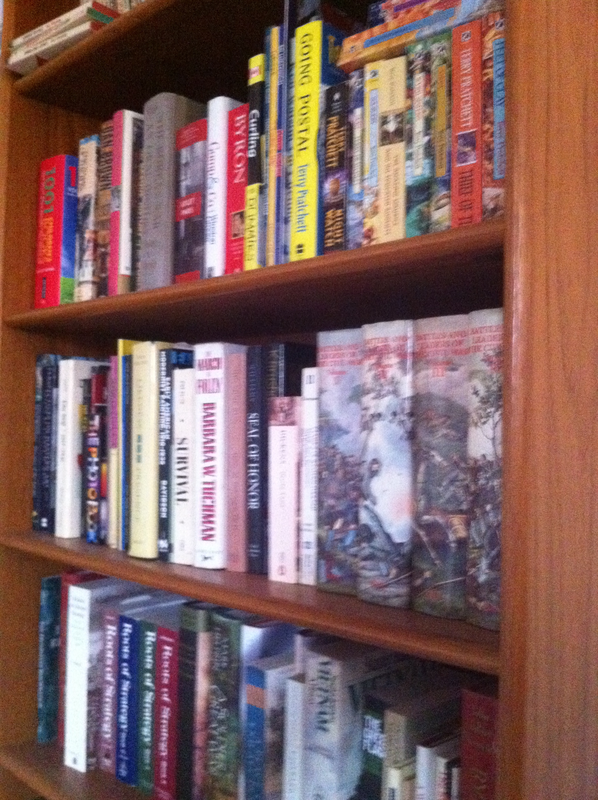 I can put a book on my Audio Book shelf. But then it doesn’t show that I read a print version, too. OK, I’m a librarian. I want things cataloged accurately and completely. But I also want to be able to go back and look at what I read 2 years ago and see what formats I read and what my reactions to each one were. I know it’s possible, because Librarything lets me do it. It will warn me I already have another addition in my library, but lets me add another one. That doesn’t mean that I’m going to give up Goodreads any time soon. 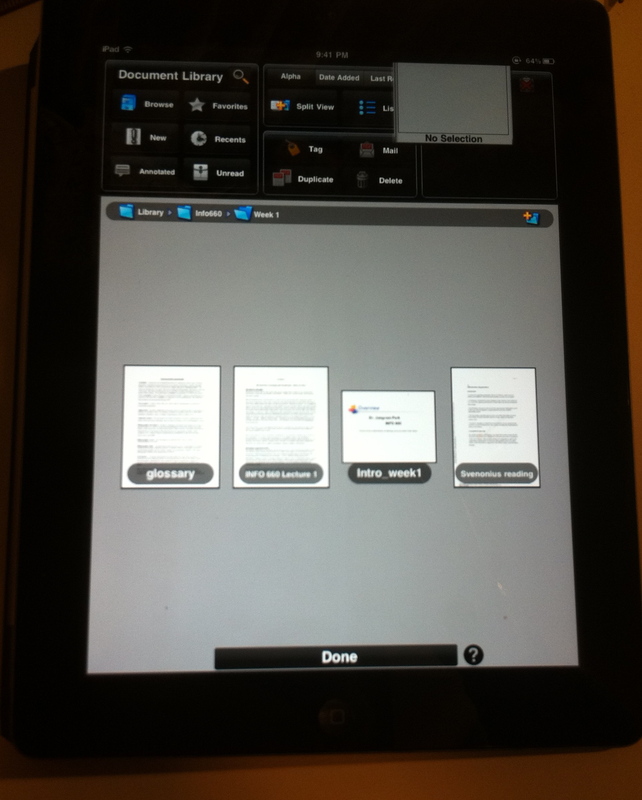 It lets me see what other people are reading, and what how they react to what they are reading. But I will probably keep my Librarything account going as well in order to track my reading for myself. The last 5 months have been nothing if not challenging! 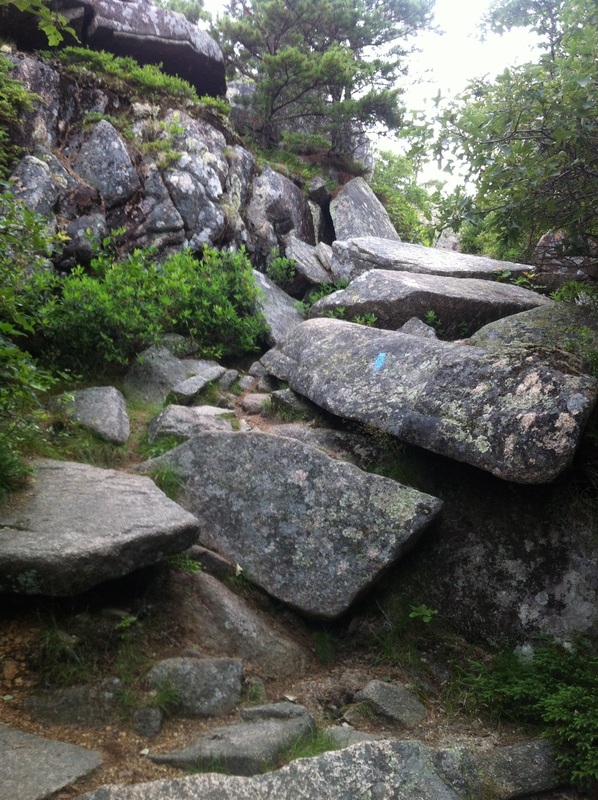 Looking back, I almost feel the same emotion I felt after completing the hiking trail in this picture – amazement that I’ve succeeded as well as I have. There have been highs and lows. I was prompted to think about what success really means in my job (Teen Librarian at a very urban library) after a program that was a clear failure. Not one teen attended – for a duct tape program! What did I do wrong? Well, the answer is probably nothing. I did all of the usual publicity for any of our library programs, plus I contacted school librarians and teachers directly to promote it. But it was mid-term exam week. Plus I know that some of my regulars had other commitments. I don’t think my program itself was a bad idea. The timing was wrong. I will be re-evaluating the scheduling of programs over the next couple of months, though I can’t really change any Spring programs because the schedule through May has already been published. Program attendance is one of the most obvious measures of success for a library’s teen services. By that measure, my teen services are a complete flop. Attendance has been down for several months. As I thought about it, I realized that I actually feel like I have been successful in my job over the last several months. But how could I measure that success? Let me stress that I am not talking about official metrics here, but evaluating on a personal level what I have actually achieved. It didn’t take me long to try to put my own stamp on our Teen Services. I quickly decided I wanted to bring a pop-up Maker Space to the library. I also wanted to increase STEM programming. I was excited to try out my new ideas. So what worked? First, I was able to take an idea from a session at the Virginia Library Association’s annual conference and create a “Choose Your Own Adventure” scavenger hunt for Teen Read Week. The scavenger hunt was probably my most successful program, both in numbers and enthusiasm. Plus it was successfully used by two of the library system’s other branches. I’ve now been asked to create another hunt for the system’s Big Read in March. Another major accomplishment is a revamping of the Teen Homework Help section on our website. It had been sadly neglected, partially because it required a little knowledge of HTML and websites to properly keep it up. Thank goodness for that Web Design course last Spring! Feedback is that the Homework Help is now helpful. Other projects and ideas I’ve had may not have been particularly successful at my library branch, but have been adopted and used by other branches with much more success. I’ve gotten the teen New Book section set up properly, with stickers and cataloging! (So important to a librarian!) The result is that New Books are getting the attention they deserve because they return to the New Book shelf after being checked out. So circulation of those is up. And my displays have been pretty successful, too, as measured by how often I have to refill them. One even made it on to the local TV news during Banned Books Week. So maybe my program attendance is sad, but my work has had a positive impact in other ways. In the new year I do need to look at ways to improve teen participation. I may need to change the day and time of the programs. Just because it used to work doesn’t mean it still does. I’ve got some other ideas for building neighborhood partnerships that may help. And it may just be cyclical. The Summer Reading Program is not far off and will be a great time to try to build teen involvement, maybe even to attract new teens. We’ll see. In the mean time I’ll focus on the fact that I have won over some of the teens who were concerned and skeptical about the new Teen Librarian, and that while I may not be directly reaching teens at my branch, I am having a positive impact on Teen Services throughout the entire system. For most people who are comfortable using a computer, the shift to accessing government services online can actually be a convenience. You can update your resume on USAjobs or change your address on your driver’s license at 10 pm in your pajamas. But for those who have no computer and no experience using computers, that change can create a barrier to obtaining services to which they are entitled. 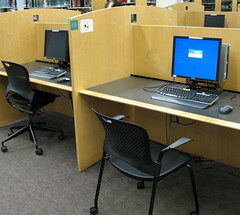 Forget doing business in the comfort of your home at any hour, they have to use a public computer somewhere, usually in a library, and so are forced to conduct their business during hours that computer is available. Odds are, there are plenty of other people also trying to use that computer. So they may be limited in how long they can use it. As I have helped patrons navigate job searches over the past several months, I’ve become much more aware of how small things that most experienced computer users handle instinctively are actually major hurdles for the computer illiterate. In the last week, I’ve spent several hours helping a gentleman who was recently laid off from his job. The workforce center gave him directions for accessing their website and sent him to the library to use our computers. He has spent the last 14 years driving a delivery truck for a moving and storage company and supervising the delivery crew assigned to his truck. His experience with computers was completely nonexistent. Imagine for a moment that you had never interacted with a keyboard. That you had no idea how an Internet browser worked or how to access a website. Now, you can’t collect your unemployment benefits unless you go online to the website and register. While there you have to create a resume. One of the first steps to registering is to input your email address. You have no email and have no idea how that works. You can barely use a keyboard and have no clue how a mouse works. If you’re lucky, someone is available to help you. If you’re not lucky, do you give up now? The man I was helping honestly wanted to learn. He was pleased each time he remembered something and was able to do it himself. But the learning curve is steep. I decided the site’s resume builder was “the form that never ends.” (Those with children of a certain age may remember the puppet Lambchop singing “The Song That Never Ends.” It goes on and on my friend. . . .) The template wanted exact dates for employment for each job. Do you remember what day you started a job 14 years ago? Or the job before that, the one you started 22 years ago? But it would not accept just month and year. Then there were the drop down menus. They are a nightmare for someone who is not comfortable using a mouse. It’s hard enough to click on a link or to insert a cursor in a data field. But try to select a year in a drop down list for a calendar without having the cursor slip to the year above or below. Experienced users occasionally fumble that. Someone with no skill using a mouse is guaranteed to find it endlessly frustrating. I could go on and on. Actually, I guess I already have. But I wonder how many people do not receive the services they should because they can’t cope with the online process. As for this gentleman, he completed the online form using their resume template and is OK for now. But he has to come in and update it regularly to show he is actively searching for a job. I also expect that jobs to which he applies will require a separate resume. So I will probably see him back again for help creating a resume in Word. And I’ll help him figure out how to do it. So he’ll learn a new computer skill. But is it a skill he will ever use in a job? I rather doubt it, given the his employment history. But forcing him to cope with the online process is saving someone somewhere time and effort – someone who probably is already proficient in using computers and the Internet. Am I frustrated? You have to ask? I recently saw a comment that the Digital Divide is not just about hardware or physical access to the Internet. I found myself wholeheartedly agreeing with that statement. Those of us on the front line, dealing with patrons and computers in the public library see it daily. And it’s not limited to types of people we expect. Sometimes it is an older person who never had to deal with computers but who can only access the government form online now. But other times it is younger patrons, those we expect to be Digital Natives. After all, they have been using Facebook and Twitter on their mobile devices for their entire teenage years. There are many studies and statistics about the ongoing Digital Divide. For a good factual analysis, try reading “7 Myths of the Digital Divide” by Jen Schradie (The Society Pages, April 26, 2013). But statistics can be dry and academic discussions can’t bring the story to life the way real-life examples can. So I’d like to share the stories of some of the patrons I have encountered in the last couple of months. The man whose work history consists of being a busboy and grocery store stocker who is looking for a job with a local grocery store. He has never had to type before let alone use a word processor, something that is very common among job seekers in the library. He needs to create a resume and submit it online. These days you can’t even get a job stocking shelves in the supermarket unless you can get online. He has an email account. But doesn’t really understand saving his resume document and emailing it to himself because anything saved to the computer is going to be wiped clean as soon as he logs off. The woman doing school work, typing documents in a word processing program who is confused by the display that shows her going on to a new page. She is afraid she has done something wrong. Again, saving her work is an issue and she ends up printing things out as she goes, even though the document isn’t finished. The twenty-something woman looking for a job in a hotel or local retailer. She has a web address, but types it into the search box instead of into the URL space. She ends up on a third party site. When helped to get to the correct hotel website, she is completely confused when the link and information she needs is not front and center but in small print at the bottom of the page. Prospective hotel guests, the primary audience for the website, don’t need the information on “Careers.” She consistently has difficulty navigating through a website and gives up, frustrated, without completing a single application. None of these people are stupid or lazy. They all want to work or learn and are trying their best. But they are not equipped to function effectively in an online world. And they are not alone! While the first two examples are older people who never had to deal with computers while growing up and have avoided them until forced to use them, the last woman is young. Most people would expect her to be comfortable with computers. And she is, in a basic way for entertainment purposes. But get beyond the basics and it is clear that she never received effective digital literacy training. What’s the answer? I wish I knew. The one thing I do know is that the problem is going to get worse as more government services are only available online and employers continue to require everyone to apply online and submit digital resumes. Conventional wisdom is that everything is available online. While librarians know that is not really true, many parts of life have moved to the digital realm. The problem is that many people are being left behind. Where Are We Going, And How Will We Know When We Get There? As I’ve started my new job, one of my first major tasks was planning programs for the Fall. Programs are a large part of what we do. But I think sometimes we get into a rut. Or we have ideas that seem wonderful in theory but aren’t as effective as we hoped. I think that there are a couple of steps normally associated with instructional planning that could be useful for library programs: Objectives and Assessment. But, you say, I’m planning fun programs for kids. Why would I use those instructional tools? Libraries are, at heart, educational institutions. Even our fun programs usually have at least some educational component, if only the hope of drawing new users into the library. On a more practical level, clear objectives and assessment after the fact provide a road map that can help us make our programs more effective. Identifying objectives can be as simple as asking why we are planning the program. What are we hoping to accomplish? What do we want participants to get out of it? Fun is a perfectly valid objective. But we can certainly think of more. Are you trying to spark creativity? Build early literacy skills? Promote a love of reading? Build community partnerships? Help teens learn technical skills? Feeling stuck for ideas – start with your library’s mission statement. Or take the idea of program objectives a step further and consider creating a vision statement for your department. Gretchen Kolderup makes a strong argument for doing just that in her article, “What I Wish I’d Known About Building Teen Services from Scratch,” which appeared on the blog In the Library with the Lead Pipe. The process of stating objectives for a program allows for more intentional and focused planning. For example, I believe that libraries are logical participants in the Maker Space movement. So one of my objectives is for many of my programs to have a creative component. I want to provide a space where teens are comfortable exploring their creativity in both arts and sciences. In practical terms, that means I will avoid craft kits where the final product is predetermined in favor of more open-ended activities. Being clear about my objectives will shape activity choices and determine the types of supplies I purchase. The term assessment can call to mind unpleasant connotations of tests and grades. But in this context, assessment is simply evaluating how the program went. Did we meet our objectives? What worked? What didn’t? What could we do differently next time? Ideally, we can also get some feedback from those who attend. To some degree, most of us do this already, even if only by discussing how things went with our colleagues. But it is worth taking to time to be a bit more methodical about the process. To return to the example of my Creator Space program, I will do informal assessment by talking to the teens who attend. I’ll ask which of the activities they enjoy and what they would like to see in the future. Then, and this is key, I will write down their responses and my own reflections on how the program went. We always think we will remember what went well and what we would do differently. But all too often the memory has faded by the time we set out to plan the next event. Nor can we share our knowledge and experience with others if we don’t record the information. Brainstorm a list of what you remember working and not working at previous programs. Write it down and add to it as you think of new things. Create at least an informal list of objectives for the program. Don’t worry about going into great detail. This is just to focus your thinking as you choose activities. Collect and record responses to the program from both participants and staff who were involved. Now you already have a jump on step 1 for your next program. And when a colleague asks for help planning something similar, you have something concrete to give them. In the long run, this simple step will make planning future programs much faster and easier. Library programs are already making a big difference in people’s lives. Adding the educational tools of Objectives and Assessment to our programming toolboxes can help those programs have an even bigger impact. New beginnings can be both exciting and scary. In the last few weeks, I’ve embarked on a major new beginning – a new job in a new city. Summer always seems to fly by. But with all of that excitement, this year it feels like I have missed summer entirely, in spite of spending nearly 2 weeks in July on a family vacation! My new job is as Teen Librarian for the Central Library of the Jefferson-Madison Regional Library in Virginia. Of necessity, that means my focus will shift from Children’s to Young Adult services. That doesn’t mean that I will drop my interest in Early Literacy and STEM programming for children. But it does mean that I will spend more time and effort on literacy issues and STEM programs for Tweens and Teens. That will be especially true in the short term while I settle in to my new job. A digital scavenger hunt in the library, perhaps sneaking in some information literacy info. Passive, creative programs. Hmmm, can I find the tangram sets I made on card stock. If not, they’re easy enough to recreate. Use the maker space idea as a springboard for Creator Space programs. Coming up with some creative and fun STEM programs for teens. Figuring out what organizations might make good partners for me for programming. What can I do with apps and tech toys? So many ideas, so much to do, so little time. But it’s going to be a lot of fun along the way! I finally took the plunge. I am now on Twitter. It turns out that the reasons I was avoiding Twitter for so long were completely valid. It is a terrible time sink for me! There is a constant stream of communication. I can’t keep up – aack! I’ll admit that many of the tweets that come through my feed don’t interest me at all. But buried in that constant stream are always a few gems. How else would I have discovered that Neil Gaiman is creating a video game that sounds deliciously creepy? I think I will have to have it. And who knew Maureen Johnson was so funny? I am getting my puppy fix vicariously while remembering why a puppy would not be a good idea right now given the craziness in my life. I realize that I need to get my act together and organize my feed. But how do I choose what to hide? If I hide some publishers or authors, I might miss a giveaway or important announcement. I could hide certain people who flood the Twitterverse with updates and stills from the movie adaptation of their book and who are constantly answering fan questions by tweeting to the world. But what if the teens I work with would be interested in those things? Shouldn’t I keep up with them then? I have barely begun on Twitter. I follow very few people yet. So I know the flood of information is only going to grow. In the end, I will make the hard choices and organize my feed so I can cope. After all, I am a librarian. Organizing information is what I do. But I suspect I will always have that nagging worry that I am missing something – never mind that if I hadn’t joined Twitter I would still be missing that and more. If you’re on Twitter and don’t follow Maureen Johnson (@maureenjohnson), you need to fix that! Her commentary on the royal birth was laugh-out-loud hilarious. I am @booksnquilts. If you follow me, I can pretty much guarantee that I won’t be flooding your Twitter stream. I tend to lurk mostly, though given my fondness for sharing information, that will probably change as I get more comfortable. It may not seem logical, but wordless books are actually a great way to build early literacy skills. By slowly going through the book together and talking about the pictures, a child learns how a book works. Encourage your child to tell the story that they see in the illustrations, thus building narrative skills. Ask what they think will happen next. As with all early literacy experiences, it is about the interaction, reading the book together and talking about it as you go. Here are some of my favorite wordless books. The Lion and the Mouse by Jerry Pinkney. Little, Brown and Co. Books for Young Readers, 2009. This book is based on the famous Aesop’s Fable of The Lion and the Mouse. The illustrations are rich in detail and absolutely beautiful. Pinkney makes a classic tale new. This book invites slow, careful reading. Read it once and you’ll understand why it won the Caldecott Medal. A Ball For Daisy by Christopher Raschka. Schwartz & Wade Books, ©2011. Another Caldecott winner, this book follows the antics of the dog Daisy as she plays with her ball and what happens when she loses it. It is easy to build a story around these illustrations. Daisy is such fun, children will love talking about what she is doing, how she is feeling, and what she might do next. Good Dog, Carl by Alexandra Day. Green Tiger Press, ©1985. Carl books are true classics. Most of the books in the series are wordless, though some have minimal text. Carl the dog is left in charge as the babysitter. He and his infant charge have great adventures, all safely over by the time Mother returns from her errands. There are so many things to talk about in these books! What are they doing? Where are they going? Does that look like fun? What will happen next? Will they get caught? Of course, children know that a dog as a babysitter is not realistic. But that doesn’t mean they won’t think the idea could be fun. The technique of reading a book from its pictures does not require a wordless picture book. Read a book together and then come back to re-tell the story from the pictures. Or let your child tell you a favorite story from the pictures. They learn that books tell stories and narratives work in certain ways. In honor of the delightful dogs, Daisy and Carl, there is a dog theme to today’s rhymes. Repeat but clap once for the first letter when you spell it out: (Clap-I-N-G-O). For each verse, replace one more letter with a clap until you are clapping for all of the letters. Have your child draw a picture or series of pictures for their own story. Ask them to tell you their story. You could write down the words on the bottom of each picture and put it all together to make a book. Use construction paper or heavy drawing paper for the cover. Instead of staples, punch holes along the edge and use yarn to bind the book. Use puppets, stuffed animals, or other toys to act out stories. This works best if you don’t use familiar TV or movie characters so the children’s imagination has free rein. Don’t have puppets? Cut out pictures from coloring pages and glue or tape them to craft sticks (what we used to call popsicle sticks). For other ideas of ways to extend the story experience, check out Story Stretchers for Infants, Toddlers, and Twos by Shirley C. Raines, Karen Miller, and Leah Curry-Rood. Gryphon House, 2002. STEM is certainly the new buzzword in library programming for children. That means a rush to create and promote STEM programming. The problem is that STEM is an educational initiative and most of the available literature is geared towards classroom activities. As yet, there is no set of Best Practices for STEM programming in libraries. The more I read about STEM activities, the more I realize that simply adding science facts to existing programs is not the answer. Yes, we already do include many STEM elements in existing programs. Even in Preschool Storytimes we do counting rhymes and have science-related themes. But to be truly effective, we need to get beyond simple counting and straightforward presentation of facts. We should be encouraging understanding of broader concepts and stimulating scientific thinking. If you think children are not capable of learning to think scientifically, I would direct you to a TED talk that includes the youngest person ever to have authored a peer-reviewed scientific study: Science is for everyone, kids included. My favorite point in this talk is that science is essentially play, something kids are inherently good at. One of the things that prompted me to reflect on how libraries incorporate STEM into their programs was a brief statement by everyone’s favorite astrophysicist, Neil deGrasse Tyson, where he answers the question: How do I get my kid interested in science? His point is that kids are naturally curious, which is the basis of scientific discovery. We need to step back and let them explore. The problem is that we often are too busy telling them to sit down and shut up because their curiosity interrupts our carefully ordered world – or program. How can we, in our library programs, encourage that curiosity? The first step, I think, is to stop compartmentalizing STEM programs. The best STEM activities are not stand-alone programs. Educators are encouraged to integrate STEM within and across the curriculum. Libraries need to integrate STEM concepts into everything they do. After all, we already integrate early literacy content into our Preschool programming, or we should be. STEM is just another type of literacy. The first step to successful STEM programs is to stop thinking of them as somehow separate from and different than our other programs. Science, math and technology are part of our everyday lives. Let’s make them part of our everyday programming as well.